JT Track Premiere: Count Basie Orchestra's "Sent for You Yesterday"
JazzTimes is pleased to premiere “Sent for You Yesterday,” a new track by the Count Basie Orchestra, directed by Scotty Barnhart and featuring singer Jamie Davis. The track will appear on the orchestra’s upcoming Concord Jazz album All About That Basie, which is scheduled for a Sept. 14 release. The new album, produced by eight-time Grammy winner and former Basie drummer Gregg Field, brings together a wide array of guest artists to celebrate the Basie band’s history, including Take 6, Kurt Elling, Joey DeFrancesco, Wycliffe Gordon, Jon Faddis, Stevie Wonder, and Basie alumna Carmen Bradford. Field himself returns to his old position behind the kit for a rendition of “Don’t Worry ’Bout Me” (sung by Elling). Longtime Basie fans will recognize “Sent for You Yesterday” as a classic blues feature for the great Jimmy Rushing. Davis, another Basie alum, makes the connection to the orchestra’s past even clearer by shouting, “Well, you came home to Joe [Williams], you came home to Jimmy [Rushing], now it’s time you come home to me…” Backing him for this track is a smaller subgroup of the orchestra featuring Barnhart on trumpet, Rickey Woodard on saxophone, Eric Reed on piano, Trevor Ware on bass, and Field again on drums. 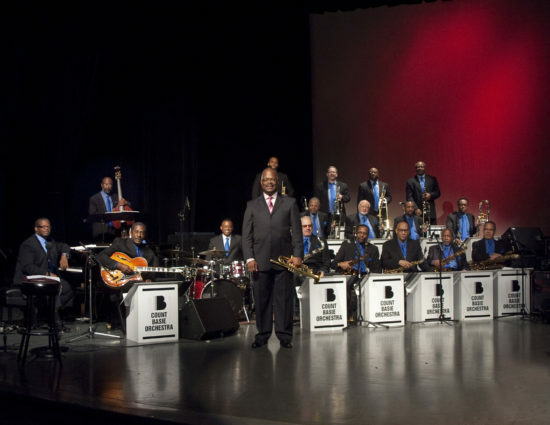 For more information on the Count Basie Orchestra, visit their website. Read about the collection of Count Basie artifacts at Rutgers University.